I don’t get to review the plays of Molière very often, but in today’s Wall Street Journal I report enthusiastically on a recent trip to New Hampshire to see the Peterborough Players’ production of Gus Kaikkonen’s new verse translation of Tartuffe. Here’s an excerpt. “Tartuffe”‘s satirical thrusts are both perennially fresh and perennially relevant, especially in America, a country that has long been beset by Bible-thumping hucksters. 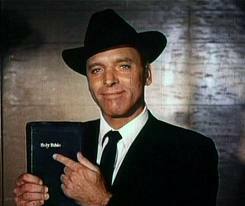 Indeed, the title character (played in Peterborough by Ian Merrill Peakes) is the French forerunner of Elmer Gantry, a versatile con man whose latest racket is religion. He worms his way into the household of the gullible Orgon (David Haugen) and sets himself up as an arbiter of moral rectitude while simultaneously seeking to bed his patron’s wife and wed his daughter, who already has a fiancée. When Mr. Kaikkonen last staged “Tartuffe” Off Broadway for the Pearl Theatre Company, he used the now-familiar rhyming translation of Richard Wilbur. In this country Mr. Wilbur’s version is more or less standard, though Christopher Hampton’s lumpy-sounding blank-verse rendering has lately found favor in England. So why do it over again? Because “Tartuffe” is a comedy, and Mr. Wilbur’s translation, a miracle of elegant versification, is more witty than funny. Mr. Kaikkonen, by contrast, has given us a blunter, racier “Tartuffe,” and though he lacks Mr. Wilbur’s technical virtuosity, his up-to-date diction and sharp timing pay off in laughter…. If you follow theater news at all closely, you’ll know that Elie Wiesel (who should need no introduction to readers of this blog) recently threatened to sue Deb Margolin and Theatre J, the author and producers of a play called Imagining Madoff, in which Wiesel was to be portrayed on stage–fictionally, but under his real name. As a result of the threatened litigation, the original production of Imagining Madoff was canceled. That cancellation, and the reasons for it, is the subject of my “Sightings” column in Saturday’s Wall Street Journal, in which I ask why so prominent a human-rights advocate decided to use the power of threatened litigation to curtail the free-speech rights of a playwright and a theater company. If you’re curious about what happened to Margolin and why it matters, pick up a copy of tomorrow’s Journal and see what I have to say. UPDATE: Read the whole thing here.